Gymnastics events are a whirlwind of excitement, both in the thick of the action and behind the scenes. Our volunteers play a vital role in transforming every event into a spectacular show. You’ll get to experience the buzz of an event in a way most fans can only dream of. 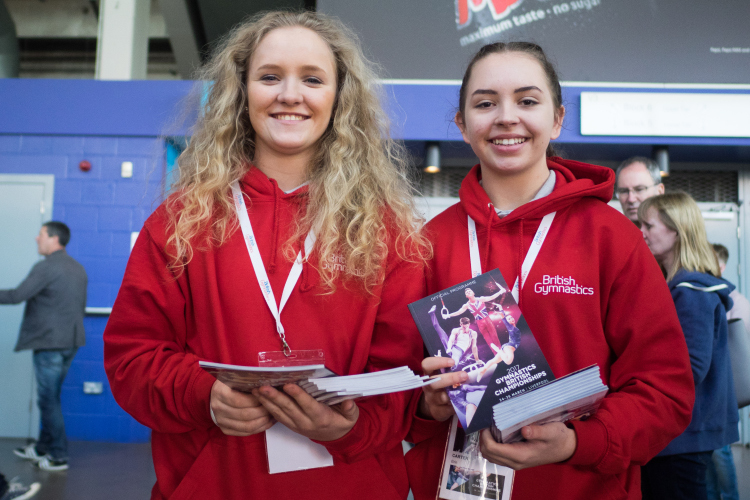 Whether it’s assisting gymnasts, coaches and event organisers at a local, regional or national event, as an important member of the team you’ll get to develop lots of skills. We host around 40 National events each year, as well as the hundreds of regional, county and club run competitions and festivals, all of which require volunteers to play a part and get involved. Every role will make the most of your skills and interests. For example, if you’re full of energy and good with people, you might assist the events team and coaches on the competition floor or registration desk, or if your skillset is more suited to a behind the scenes role, you could assist with distributing or collating results. You don’t need any experience, but you will gain a lot. By becoming a regular event volunteer, you’ll also open the door to more opportunities. For example, we reserve a number of volunteer spaces at British Championships for people who have volunteered at local and regional events annually. OK, I’m in. How do I start? If you’re ready to do something amazing with your spare time, we can’t wait to meet you. Take your first step to becoming an event volunteer by telling us a little about yourself.